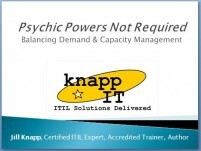 ITIL 4 Foundation: Train the Trainer « Knapp I.T. 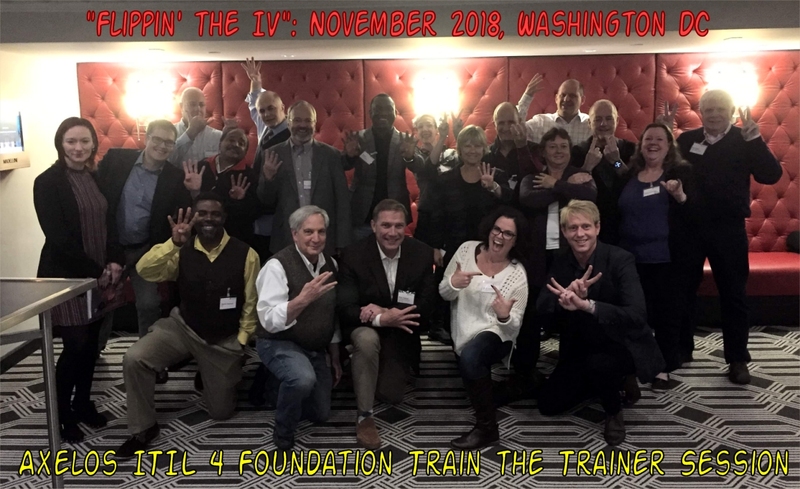 I was lucky enough to be invited to attend Axelos’ ITIL 4 Train the Trainer session in Washington DC in November 2018. Hundreds of instructors applied to attend, and only about 100 were actually accepted across a few sessions worldwide. I feel very, VERY lucky to have been chosen. I think the only reason I was chosen was because of my ITIL Foundation LiveLessons product has done so well (thanks to many of you all! <3), and they knew I’d be wanting to create new courseware and hopefully another set of LiveLesson videos for ITIL 4. The goal of these Train the Trainer sessions was simply to learn the differences between ITIL V3/2011 and ITIL 4. It wasn’t a full-blown ITIL 4 Foundation class, it was a “What’s different, let’s make sure you instructors understand it right here from the horse’s mouth, let’s all figure out together how you’ll teach these new concepts to your students, and let’s all take the official ITIL 4 Foundation Exam so we can be certified ahead of everyone else, and so we can give exam feedback to James The Official Axelos Exam Creator Guy.” It was a ridiculously helpful two days! The absolutely magical Donna Knapp from ITSM Academy taught the class, and she did a spectacular job. (That’s her, on the right side of the photo.) It was so great to finally meet her in person! I’ve known about her for well over a decade, and I lost counting the number of people who ask me if we’re related. For the record, Donna and I aren’t related, though I wish we were because I admire her to the moon and back! We were all instructed to read it before class, and I dutifully did. What I like most about it is its readability. It’s easy read and understand, and there is a little story that flows through the entire book making the concepts easier to grasp because you get to know each of the characters, their roles, and how these ITIL terms and practices relate to them. It’s not a terribly huge book, either. It’s not intimidating. I also admire the heck out of the authors… the team of writers responsible for this thing are some of the industry’s most important (and not to mention some of my favorite) ITSM thought leaders. Some of the changes to the framework, what little we know about it since this is just a Foundation book, are really logical. They got rid of ITIL processes and functions and now call them all practices. How many times did we have to drill into students’ heads that “The Service Desk is the FUNCTION that does the Incident Management PROCESS.” So we don’t have to worry about that anymore. Back in ITIL V2/V3/2011 we learned that a PROCESS is a step of steps for getting something done (for turning inputs into outputs). And ITIL 2011 had 26 processes. Like, the process steps for Incident Management are in order and make logical sense… you can’t categorize an incident until you log it, theoretically. But can anyone tell me the steps, in order, of the Information Security Management process, or the Availability Management process? Nope… because there aren’t really any super-specific steps, it’s just something you kinda do. So ITIL 4 gets rid of the word “process” in that sense and replaces it with “practice,” so you’d have an Availability Management practice. Aaaaah, much better. It’s also nice to see ITIL aligning with DevOps and Agile, because every time I teach a class with anyone younger than 55 in it, everyone argues with me about Change Management and Release and Deployment Management, and how people can’t seem to get anything done without Change Management authorizing everything every step of the way. Now of course, ITIL is and has always been “just a framework,” meant to be adopted, adapted, and even ignored when necessary, but students eager to pass a test really stressed out about that. So it’s nice to see that. It is super-confusing to me that a book called “ITIL 4 Foundation” can exist without any other ITIL 4 books. Like, what is ITIL 4 Foundation, um, founded on? It seems really premature. It’s like we’re just watching the movie preview even though there’s no actual movie yet. I also wish that things had different names, because so many of the names and terms are confusing, especially to someone new. The Service Value System, the Service Value Chain, and Service Value Streams are three very different things. Service Relationship Management and Relationship Management are two very very different things. The activities of the Service Value Chain aren’t explained well to me, and no matter how many times I ask for clarification, nobody can clarify it for me… specifically the definition of the “Build/Obtain” piece. In Jill-language, this is the value-chain activity where we buy something or build something. Customer needs a new application? Okay great, let’s decide if we should buy it or build it. Awesome. Makes sense. “All new resources are obtained through the obtain/build activity.” Sweet. Makes perfect sense. But the ITIL definition is “The purpose of the obtain/build value chain activity is to ensure that service components are available when and where they are needed, and meet agreed specifications.” How on earth do you get “buy or build” outta that? And no matter how many times I ask, nobody can explain it to me. So I recognize I might be stupid here, and that I just need to accept it and memorize it and shut up about it. But MAN, do I hate not understanding something in my bones, especially when I have to teach it. Because what if one of my students needs clarification? I’ll be stuck. What did I think of the ITIL 4 Foundation exam? I felt like it was a very fair exam. It was really, really cool and very helpful having James The Official Axelos Exam Creator Guy(“TOAECG” – haha) attend our sessions, so we could not only give him feedback on the actual ITIL 4 Foundation book itself, but so we could give him feedback on the Foundation Exam Syllabus and whether we thought we could teach it all in the recommended 12 contact hours. We were also able to give him feedback on the sample exams, as well as feedback on the real exam. We felt very heard, which we all appreciated so much. The correct answer is obviously (D) (C) Service Operation, but you’ll notice that answers (B) and (D) are totally made up things and completely unrelated to ITIL. My examples are silly, but on the real exams of the past, sometimes using totally fake (but plausible-sounding) answers was just cruel. In the ITIL 4 Foundation exams, all possible answers will be real, actual ITIL 4 things; there won’t be any made-up terms. I appreciate that. We all thanked James TOAECG very much for that. Was it an easy exam? Nope. Was it the hardest thing I had ever done? Nope. Was I glad I studied? ABSOLUTELY, and that’s coming from me, someone who has written books on this stuff. If you’re an ITIL V3/2011 ITIL Expert, you can probably pass the ITIL 4 exam just based on your old V3/2011 skills and your smarts. If you’ve only got your ITIL V3/2011 Foundation cert and you took that class/exam a few years ago, then I wouldn’t take the exam lightly. Personally: I read the entire ITIL 4 Foundation core book, I sat in an intensive two-day session filled with fellow ITIL Experts, and I studied my face off, and I got a 37/40. (I’m not going to lie and tell you I got 100%; I didn’t.) But I was pretty surprised I did that well– I did not feel very confident coming out of the exam session. So when it comes time for you to take the class and take the exam (I would wait until 2020, honestly), TAKE YOUR TIME. I surprised myself, but I was the last one of my whole class to finish my exam. It was tricky, for sure. Not for a while. First off, ITIL 4 isn’t even out yet, though it will be any day now. But besides that, I am a firm believer in “Never install a new operating system until at least one service pack comes out.” That same logic applies to ITIL and courseware, and especially applies to something like LiveLessons Videos that have to be as perfect as possible the day I create them, because making updates to them is nearly impossible. When I created my ITIL 2011 Live Lessons videos in 2015, I had been teaching ITIL 2011 for a few years, so I was very comfortable with the material, I had my schpiel down, and there were very few do-overs. I want my ITIL 4 Foundation LiveLessons to be that effortless, and I’m sure you do, too. There’s no rush. Relax. You don’t win a medal or a monument if you’re the first person on your block to earn an ITIL 4 Foundation certificate. Does that mean I’m going to wait 4 years before making the videos? Of course not! But I want to wait until I feel like I can make a really great product that is worthy of your time and money. Hopefully I’ll have something ready by the end of the year. Until then, THERE’S NO NEED TO RUSH TO GET STARTED WITH ITIL 4 ON YOUR OWN. ITIL V3/2011 IS NOT GOING ANYWHERE, AND ALL ITIL V3/2011 PRACTITIONER and INTERMEDIATE CLASSES ARE ALL USEFUL AND FULLY TRANSFERABLE IN THE ITIL 4 SCHEME! ITIL V3/2011 ISN’T GOING ANYWHERE UNTIL AT LEAST Q3 2020! YOU HAVE TIME! So with that, sit tight, and let’s take this ITIL 4 journey together. Patience, Grasshopper. Is there a big deviation from ITIL v3? Would reading/watching ITIL v3 material be helpful before going to ITIL 4? If you’ve never had any ITIL training yet, then it might make sense just to start fresh with ITIL 4, once all of the books come out. The versions are quite different. But ITIL 4 (as it stands right now) doesn’t have the depth that ITIL V3/2011 offers, so you’d be missing out on the practical information that ITIL V3/2011 provides by going straight ITIL 4. If you’re serious about ITIL (and you may not be, and that’s OK! ), my suggestion would be to take V3/2011 because so many companies have invested hundreds of thousands of dollars on ITIL V3/2011 training and tools (tools like Service Now, Remedy, or whatever you use to log tickets), and it will be years before those tools catch up to ITIL 4, and even longer before companies adopt those tool changes. So you may as well learn the same language everyone else speaks. Also, once you take ITIL V3/2011 Foundation, if you choose to take additional Intermediate or Practitioner classes in ITIL V3/2011, that knowledge (and those credits) are fully transferable and completely useful and useable in ITIL 4, and will be a big help. With the cost of ITIL V3/2011 training beinng so inexpensive (especially if you take an online course and take the exam online), it seems like a great way to get ahead of the game. ITIL 4 Foundation doesn’t give much practical information. For example, the section on Configuration Management in ITIL 4 is literally one slide that just says “This is the purpose statement of Configuration Management. The End. Make sure you memorize that for the exam.” But what has that taught you? where in ITIL V3/2011 you get a whole description of the process, what it does, why it’s important, what the steps are, the basic job duties of the main roles of the people involved in the process, how it’s related to other processes, etc. But until the rest of the ITIL 4 books come out, I have no idea of knowing if ITIL 4 will ever provide that same level of helpful information. I don’t know if I answered your question or not, but hopefully I’ve given you some info to make the right decision for yourself! Good luck my friend, and thanks for stopping by! My first question is that should I wait for now until you release your DVD set for ITIL 4 or should I start watching your ITIL V3/2011 DVD videos and take notes? Second thing, would I have a better understanding of the material if I started with ITIL V3/2011 background or it is unnecessary? First off, ITIL V3/2011 hasn’t gone away– you can still take the ITIL V3/2011 training and exams until at least mid-2020. ITIL V3/2011 won’t be replaced or retired for another year or so… so you didn’t miss out on anything! You can do the same training and exam that your friend did. (Congratulate your friend on a 40/40, by the way! That is rare and amazing!!) My ITIL Foundation Exam LiveLessons videos are still valid and useful. I won’t be making ITIL 4 Foundation videos for a while. This is because ITIL 4 is not fully out yet. You see, ITIL stands for “IT Infrastructure LIBRARY” and is a set of books. A Foundation class teaches the highlights of all the books. 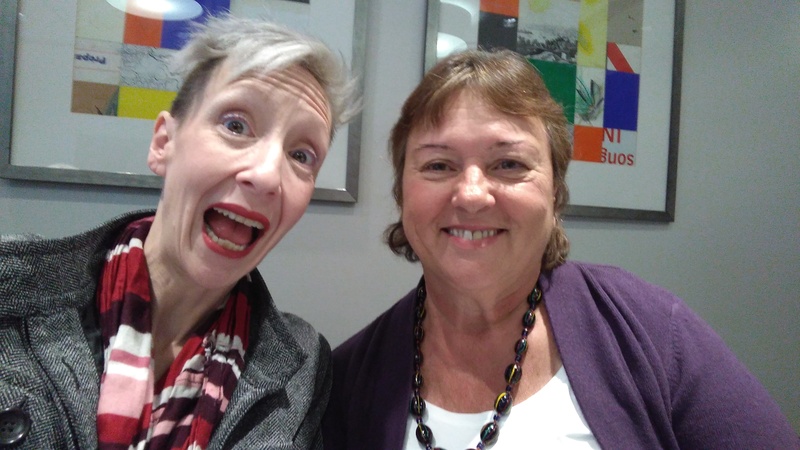 But they haven’t written or published all of the ITIL 4 books yet– they only wrote one book so far, which is a little overview book… but an overview of what? So there’s no real content to ITIL 4 yet, only basic concepts and vocabulary… but it doesn’t really tell you how to do anything. It’s just a little intro book. There’s been so much marketing hype around ITIL 4 that everyone thinks it’s this huge great thing– and I’m sure it will be someday once the rest of the books come out. But right now it’s like you’re watching a movie preview but the actual movie itself isn’t out yet. Does that make sense? If your goal is to just be Foundation certified, go with ITIL V3/2011 because you learn more practical information in a V3/Foundation class than you do in a half-baked ITIL 4 class. That’s my advice. You can do as you wish, of course! My ITIL 4 Foundation materials probably won’t be out until the (northern hemisphere) winter, if I had to guess. If you do want to take the ITIL V3/2011 class your friend took, go to http://pearsonitcertification.com and use code KNAPP60 for 60% off the price. It definitely helps!